Based on reviews from 321,107 users. 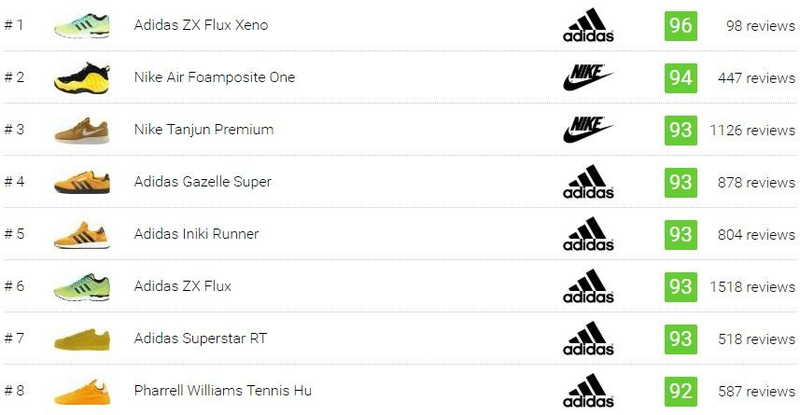 Learn how our rankings work or see our guide to yellow sneakers. Updated Apr 2019. The color scheme is arguably the paramount feature that many are considering when purchasing a shoe. A design may give the shoe its distinction, but the color can make or break one’s style. Modest and neutral color schemes grant versatility to a sneaker, while the vibrant and flamboyant color schemes tend to catch attention. As one of the vibrant colors, yellow has been associated with many qualities such as warmth, energy, enlightenment, and joy. These qualities also resonate when it comes to yellow sneakers. People who wear sneakers with a splash of yellow offer exuberance and a cheerful vibe to their style. 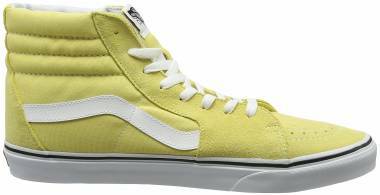 Below is a short compilation of the best available yellow sneakers on the market. An Adidas running-inspired low-top sneaker that showcases a futuristic design. Exhibiting snakeskin pattern on its upper which boasts the Xeno technology, which delivers an impressive luminous effect on the sneakers when struck with light. This model together with two others makes up the Xeno Collection. A collaboration that befits Pharell Williams’ unique style. Similar with the red colorway, the Pharell Williams x Adidas Human Race NMD yellow sneakers features the word Human on the right foot and Race on the left. 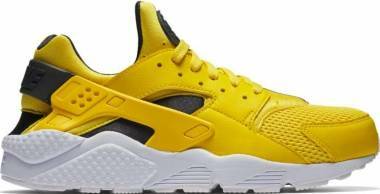 It was initially released in a vivid yellow colorway. The shoe has a distinct lacing style and Boost cushioning that offers a responsive wear. Taking from the 70s classic design, the Iniki Runner yellow sneakers is an excellent option for strolls due to the presence of Boost soles and its lightweight construction. Buyers admired its retro style and multiple colorways. 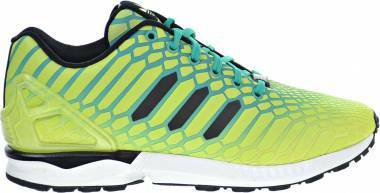 The casual, low-top, ZX Flux exhibits the design of a performance shoe. A mix of synthetic and reflective materials makes these yellow sneakers street-worthy. Adidas made this model to match the famous Nike Roshe Run. One of the more recent updates of the timeless Adidas Superstar. It showcases monochromatic color for most of its colorways and is offered in leather and suede versions. Similar to its original model, there are a plethora of occasions that it can be used, proving the sneaker’s versatility. Inspired by the Adidas Stan Smith, this sneaker collaboration with Pharell Williams. These yellow sneakers have an ultra-soft mesh textile upper and a unique lacing enclosure to provide wearers with comfort and style with each step. The Primeknit model of the Tennis Hu is also available. The vintage Superstar gets a fresh retake with vivid colorways to entice casual and loyal fans of the sneaker. Initially released in 2016, the Superstar Adicolor features a retro-style design with padded insole, collar, and tongue which delivers comfort. Similar to the classic Superstar and Gazelle, the Adidas Campus boasts the iconic Trefoil and Three-Stripe branding which became a renowned attribute in the sneaker culture. From skateboarding to merely walking, these yellow sneakers has been a staple ever since its introduction in the 80s. One of the most revered shoe in sneaker history. Since its introduction more than half a century ago, it captivated fans of all ages. Originally designed as a soccer shoe, the Gazelle yellow sneakers have been vastly famous on the streets due to its versatility. Comfortable and stylish, this shoe deserves all the accolades. This sneaker is part of the Adidas NEO label, which is marketed to younger consumers. 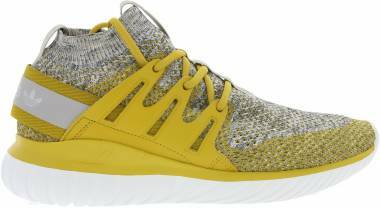 The two-tone upper is made of mesh style fabric which makes the Adidas NEO Cloudform Race yellow sneakers breathable and lightweight. Its midsole is made from ethylene-vinyl acetate or EVA which contributes to the sneaker’s plush cushioning. The Adidas Adiease is conceptualized as a skateboarding shoe. Over the years, numerous collaborations and variations have been released. The low-top Adidas Adiease Premiere yellow sneakers feature a similar design of the original model but with the inclusion of AdiTUFF on its toebox which offers enhanced support. Its faded yellow colorway looks excellent on and off the skate. Aside from displaying vibrant monochromatic colorways, this sneaker also features premium leather overlays across the upper. These qualities add elegance and style to the modest aesthetic. These yellow sneakers is described by wearers as comfortable and lightweight, due to its Primeknit upper. Featuring a unique contemporary design and lacing enclosure with support details, the Adidas Tubular Nova Primeknit a likely choice for casual ensembles. Adidas made a flashy revision of the vintage Stan Smith. Offered in monochromatic colorways, the Adidas Stan Smith Adicolor yellow sneakers provides a fresh and distinctive look for longtime or new fans of the shoe line. It features two of Adidas’ innovations, advanced color shift technology and the Chromatech technology. The Adidas SL Loop CT yellow sneakers a must have for wearers who want a glimpse into the future of sneaker design. With more than 90 colorways offered for this sneaker, it is safe to assume that the Gel Lyte III from Asics yellow sneakers garnered an impressive amount of approval from consumers due to its distinct design, comfort, and budget-friendly price. The Chuck Taylor is one of the most iconic shoes in history. Since its initial release in the early 1900s, it has been adored worldwide due to its striking design and versatility. 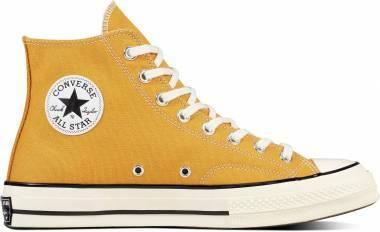 The Chucks low-top yellow sneakers is an excellent choice for a summer sneaker due to its multiple colorways and a canvas upper. This model is a reissue of Onitsuka’s most popular sneaker. Its throwback design goes well with a variety of casual clothing, but some are also wearing it for workouts as it also exhibits support features. A performance lifestyle shoe featuring a laidback design is what the Onitsuka Tiger Colorado Eighty-Five yellow sneakers is. Comfort and flexible, wearers will have no issues when using the sneaker for long hours. 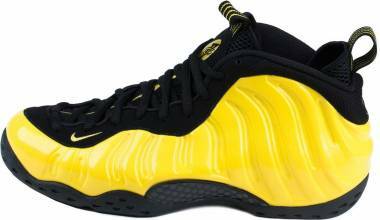 One of Nike’s most popular models, the Foamposite has been a fan favorite since it was endorsed by Penny Hardaway in 1997. Since then, there is a multitude of models that were released over the years in a variety of colorways. While it is not the most affordable shoe, sneakerheads don’t mind as the style and heritage is more than enough reason to make a collection out of this sneaker. Labeled as “Mom’s favorite shoe,” because it has become of top choice of mothers due to its comfort, unassuming style, and an affordable price. Tanjun is a Japanese word which means simplicity. The Nike Tanjun Premium https://runrepeat.com/nike-tanjun-premium yellow sneakers embody the essentials of what an everyday shoe needs to have. Not everyone will appreciate this sneaker’s design, as unique may be an understatement on describing its aesthetic. 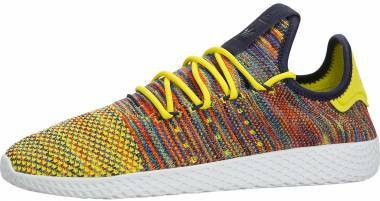 While it may not be appealing design-wise, the Nike Mayfly Woven yellow sneakers make up for that unconventional exterior by offering a breathable, lightweight, and comfortable wear. The Air Max is one of Nike’s marquee sneaker series on its roster. One of its modern updates, the Nike Air Max Zero QS yellow sneakers showcase a premium and contemporary look. Consistent with the other models under its line, the Air Max support features assures wearers of a responsive cushioning. A hybrid model of Air Max 1 and Air Zoom Moire. Sneakerheads and casuals are going to love these yellow sneakers because of its support details and 20 colorways to choose from. True to its name, the Puma Suede Classic features a vintage aesthetic which remains in style ever since its introduction about 60 years ago. The suede upper became its trademark because of its stylish vibe. There are over 50 colorways released for the Puma Suede, a testament to its timelessness. Remarkably, the futuristic Fury OG was first introduced in the 90s. 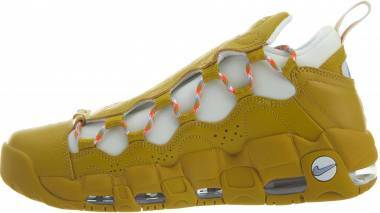 These yellow sneakers gained immense approval from the fans due to the inclusion of the Pump Technology Full-Foot Chamber System which delivers a customized fitting and enhanced cushioning. Offered in men and women’s sizes, this sneaker boasts comfort with each step due to the GRID technology. Initially, the GRID was meant to help with overpronation of runners, but now wearers can also experience the support when doing casual strolls. The Saucony Grid SD yellow sneakers have an ageless style and a great option for spring and summer activities. An iconic Vans footwear, the SK8-Hi maintains its stylish look for decades. Its canvas construction and the signature Sidestripe branding simply appeals to the consumers. There was a time that people customized the design of the SK8-Hi to express their individuality. Yellow sneakers may not be the first option for many probably due to its susceptibility to dirt, stereotypically not a unisexual color, or for some, it is just simply it is not easy to match it with everyday clothing. Below are ten suggestions each for men and women on how to integrate the yellow sneakers on various clothing combinations. Pair the yellow sneakers with blue jeans and a black crew-neck t-shirt. Mix it up with a combination of navy jeans and a multi-colored jacket. Define the dress-down ensemble with a pair of yellow sneakers, light blue ripped jeans and a beige moto jacket. Up the ante by matching the yellow sneakers with gray wool trousers and a gray overcoat. Blue ripped skinny jeans and a black jacket is certain to define one's street-style fashion. Be different with an uncanny combination of vertically striped suit, a green camouflage jacket, and a pair of yellow sneakers. Olive green chino with a charcoal print t-shirt brings out one’s laid-back style. Chinos and parka in navy color, when paired with yellow sneakers is a stylish get-up, especially during cold weather. Charcoal shorts and a red checkered button-down polo seems to be a popular choice. If going for a more sophisticated look, wearing a camel suit and a white shirt stands out. Skinny black jeans with a black quilted leather jacket is a fantastic option when paired with low-top yellow sneakers. Black leather sweatpants with a charcoal leather vest give off a relaxed vibe. Dark-colored fitted pants and a chunky black cardigan is a great outfit arsenal when wearing yellow sneakers. Casual strolling can be stylish when pairing the yellow sneakers with a black skater skirt and a red cardigan. Complete the tourist attire ensemble with a beige straw hat and shades. Make a fashion statement by wearing a hunter green camo jeans with a white dress shirt and white cropped top together with a high-top yellow sneaker. Stand out by rocking an animal print blouse and brown leather skinny jeans. Look elegant by opting for a green pencil skirt, a white fur jacket, and a white tank top. Wearing black floral fitted pants and a black floral blazer with yellow sneakers looks stunning. For weekend activities, putting on blue denim shorts, a blue denim jacket, and a gray knit tank is as comfortable as it looks. Be casually fashionable by wearing gray leggings, a printed white cardigan, and a green-yellow tank. The legendary Bruce Lee donned a yellow-and-black jumpsuit on his movie “Game of Death.” That yellow jumpsuit became his trademark, as a plethora of movies, tv shows, and video games that has a Bruce Lee-inspired character, more often than not, wears it. It made such an impact that when the original Bruce Lee’s jumpsuit was auctioned, it was sold at a little less than $100,000. Many collaborations have been attributed to the Bruce Lee yellow jumpsuit. The Nike Kyrie 3 Bruce Lee, Bait x Bruce Lee x Onitsuka Tiger Colorado Eighty-Five, and Reebok Kamikaze 2s are just some examples of yellow sneakers that were made to pay homage to an immortal figure. How do you clean yellow shoes? Wipe off debris and stains on a leather surface by making a solution out of equal parts white vinegar and water. Rub using a soft cloth once the shoes are dry. For scuffs, use a wet cloth dipped in baking soda. Use a nailbrush to carefully buff stains away. Once the surface dirt has been scrubbed off, use additional pressure on the brush and go back and forth to remove the deep stains. For those stubborn stains, use a white washcloth dipped in white vinegar or rubbing alcohol and rub until the desired result is achieved. Using a clean toothbrush, start wiping off the dirt on the canvas upper. Then make a paste of equal parts water and baking soda. Dip the toothbrush in the paste and scrub the shoe's soles. Next, use the washing machine on gentle cycle with cold water and detergent to further clean the sneaker. Don't use the dryer as it may shrink the shoes, just let them air dry. Remove the loose dirt first using a toothbrush. Then, dip the toothbrush into a cup of water mixed with laundry detergent. Continue scrubbing the rubber surface with the dipped toothbrush. Remove the suds off by using a wet sponge. After that, let it air dry. Is owning a pair of yellow sneakers worth it? Diversification is the operative word. While most people are more into consistency when it comes to their style, trying a different approach adds fun and excitement. In the case of footwear, yellow sneakers are not genuinely considered as "pop" because it is not as versatile as the black or white-colored sneakers. But the yellow sneakers has its own charm, as it brings a vibrant and exuberant vibe to one's style. Mixing up one's fashion ensemble with yellow sneakers brings a level of individuality and recognition. To answer the question, yes. Owning a pair of yellow sneakers is worth it. What are some ways on how to extend the lifespan of yellow lifestyle kicks? Keep the shoes away from light and air when not in use to prevent the "yellowing." Use a regular zipped bag to store the yellow sneakers properly. Consider buying shoe force fields to minimize creasing. Don't wear the yellow sneakers during bad weather because even the slightest rain may damage the shoes. Try to wear the yellow sneakers twice a week max. Never leave the shoes by the door as it will collect dust. Use a different footwear when driving as the yellow sneakers will crease on the front of the foot. Don't continuously clean the shoes after every use. The yellowing will appear immediately if the shoe has a regular contact with water. What makes the sneakers turn yellow? The yellowing on the sneakers drives the sneakerheads and casuals crazy, especially for the white-colored ones. Yellowing gives the shoe an old look, effectively removing any of its new and fresh appeal. For the yellow sneakers, it poses the same effect. It is very easy to distinguish the yellowing from the actual shade of yellow on the sneaker. Oxidation is the main culprit of the yellowing of the shoe. Given the oxygen surrounding us, it goes without saying that the discoloration process is inevitable. Any sneaker that is being worn outside during good or bad weather is all prone to yellowing. Pouring bleach on the sneakers will also result in yellowing over time. On some cases, there are specific materials that exhibit a yellow crack once it gets old. Are there some negative connotations associated with the yellow? Calling a person "yellow-bellied" is tantamount to being called a coward. Yellow journalism is a phrase used to label an irresponsible reporting.